My dear sister Cheryl is a bright, light-hearted spirit, who is an inspiration to all who know her. 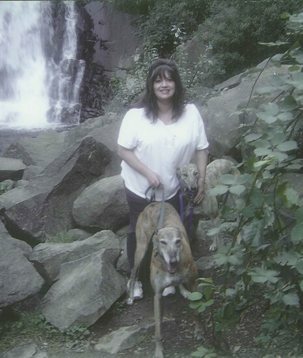 She’s a wonderful sister, a loyal and generous friend, and a devoted “Mom” to two adopted/rescue greyhounds. Cheryl is courageously battling end stage renal disease. For five years, Cheryl has been on dialysis, which keeps her alive. Though Cheryl does all she can to be as healthy as she can on this treatment, her best option for a long and healthy life is to receive a kidney transplant. I had hoped to be a live kidney donor for Cheryl, however, testing showed that I’m not a donor match for my sister. This year Cheryl and I will be added to a list comprised of both kidney-transplant recipients, and kidney donors, hopefully to find a kidney donor match for Cheryl, and a kidney recipient match for me. We should eventually be successful, and Cheryl will happily receive her life-saving kidney transplant! Transplants are extremely expensive. Though insurance will cover the bulk of the procedure, Cheryl will have many out-of-pocket costs. To help with transplant expenses, a fundraising campaign in Cheryl’s honor has been established with HelpHOPELive, a nonprofit organization that has been assisting the transplant community for 30 years. All donations are tax-deductible, and are held by HelpHOPELive in the Northwest Kidney Transplant Fund, and are administered by HelpHOPELive for transplant-related expenses only. If you wish to make a contribution, please select the “Donate Now” button or see the “Mailing a Check?” box on this page. It’s never easy to ask for assistance. Cheryl’s transplant expenses are a difficult challenge. Your financial gifts, and prayers, are greatly appreciated!